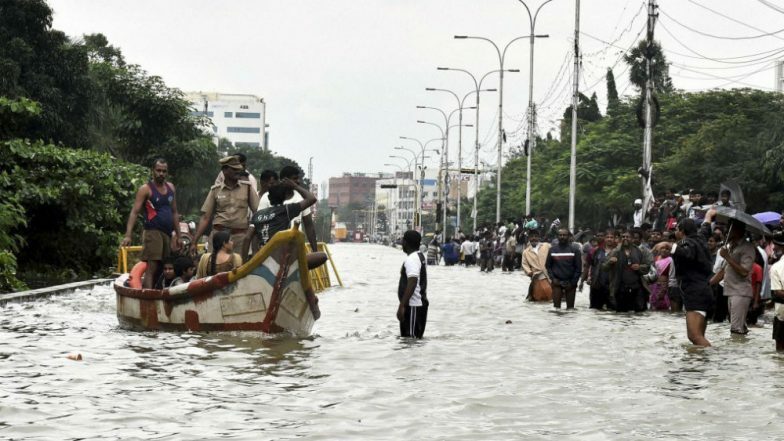 New Delhi, June 19: In a bid to meet the long-lasting demand of the inhabitants of the flood-prone areas, the government is mulling to team up with tech giant Google to help with flood forecast. Union Minister Nitin Gadkari on Monday expressed hope that collaboration with Google will help in effective flood management in India. According to a government release, the Central Water Commission (CWC), India’s apex technical organization in the field of Water Resources, has entered into a Collaboration Agreement with Google. CWC would use state-of-the-art advances made by Google in the in the field of Artificial Intelligence, Machine Learning and geospatial mapping for effective management of water resources particularly in the field of flood forecasting and dissemination of flood-related information to the masses widely using the dissemination platforms developed by Google. This initiative is likely to help crisis management agencies to deal extreme hydrological events in a better manner. Under this Agreement, CWC and Google will share technical expertise in the fields of artificial intelligence, machine learning, geospatial mapping and analysis of hydrological observation data to collaborate on (i) improving flood prediction systems, which will help provide location-targeted, actionable flood warnings, (ii) high priority research project utilizing Google Earth Engine to help visualize and improve flood management and (iii) a cultural project to build online exhibitions on the Rivers of India . Till 2016, CWC was disseminating flood levels with maximum lead time of one day. During the flood season of 2017, CWC resorted to rainfall based modelling and issued flood advisories on trial basis with 3 days lead time. Under the collaborative arrangement, Google would use high-resolution Digital Elevation Model and vast computational resources and its expertise in the field of Artificial Intelligence to generate flood inundation maps utilising the level forecast input provided by CWC. The information in the form of likely extent and depth of inundation would be disseminated with a lead time of up to 3 days. For the flood season of 2018, inundation forecasting would be done on trial basis and the same would be up scaled in near future. The collaborative arrangement is likely to result in saving of crore of rupees which otherwise would have to be spent by the government on acquiring high-resolution DEM, high-end computational resources and developing dissemination platforms widely used by the masses. This would enable the Government as well as disaster management organisations to identify well in advance the locations and population, which are at risk from floods and require warnings and information. This collaborative initiative is expected to be a milestone in flood management and in mitigating the flood losses.